Laura Guyer Rieger is known as "The Madonna of the Mills." She makes it her mission to rescue dogs from the puppy mills of Pennsylvania. Laura and her work, through her rescue No More Tears Rescue, have been featured on a HBO show, called "Madonna of the Mills." Her inspiring life and work on behalf of all the voiceless pups are now on view for the world to see. NEBTR is privileged in having been able to work with Laura. 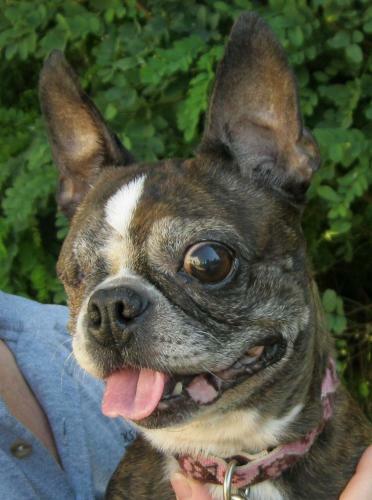 She pulled Rosie from a mill, and Rosie was fostered by Tammy Trivelpiece until her forever home was found. 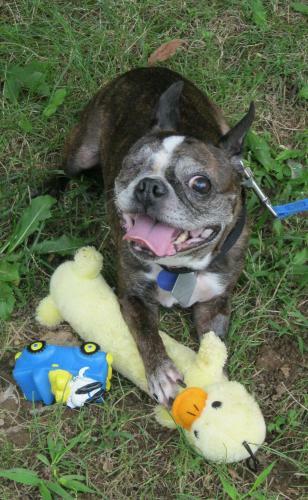 Most recently, she was involved in the rescue of 20 dogs from West Virginia, of which several were Bostons now in the care of NEBTR. LuLu is now in Renee Posey's foster home after being first cared for by Carolyn McCarthy of Kamp Kanine, and Sweety is with Elly Monfett. Laura says about NEBTR, "Thank you guys for always helping us out with the Mill dogs, you never ever say no. I am so proud to work with your rescue! NMTR"
God bless Laura and her work! 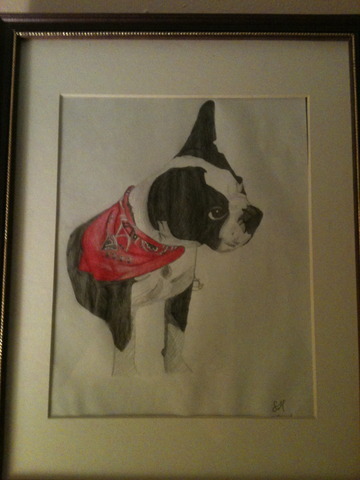 Check out the adorable Boston Terrier print below! Samantha Heckathorn of the Midwest Boston Terrier Rescue made it to benefit the Rescue, which has been swamped with medical bills for their fosters. Her note and all pertinent information is below, so please contact her to purchase one to support their rescue! I am selling prints of a pencil drawing I did of my little Boston, Mandy, to benefit Midwest Boston Terrier Rescue. MWBTR is hurting for funds right now because of some expensive vet bills for a few of our recent fosters. I adopted Mandy from MWBTR and have done some volunteering for them, so I am trying to use my artwork to help them as well. The prints are going for $30/print, and can be shipped anywhere in the U.S. 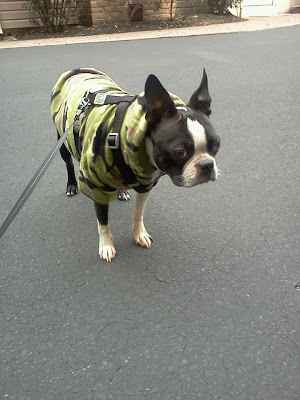 Please spread the word to all Boston Terrier- and dog-lovers! This drawing will look great in any living room! If you have any interest, please direct e-mails to me at sammyantha07@yahoo.com. I have attached a picture of the drawing here, as the original is currently hanging in my living room. 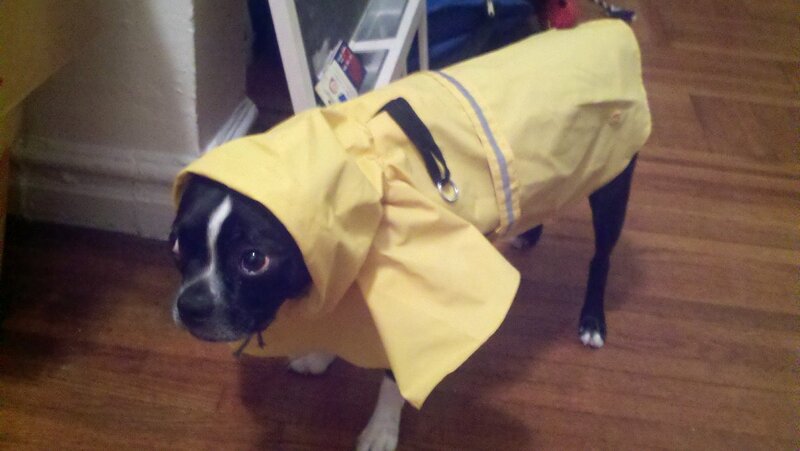 Please help out your fellow Bostons! 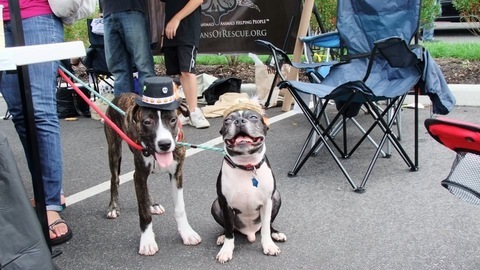 4th Year Journalism Student, The Ohio State University"
Otis pictured above with a rescue pup named Bam Bam. Otis did a great job at the event I was at over the weekend. He played with 9 4-7 year old kids for over an hour. He adores them. It's too cute. He cried for hours after they left. Broke my heart. He just wants to be surrounded with people and other animals all the time. Precious boy. He can be alone about 2 hours now before he starts digging himself, and he isn't chewing his feet anymore. We are getting there. I think being handled by different people is helping him. Otis is a very special boy. Seeing him become more confident he won't be abandoned and that people come back is so rewarding. He's got the best faces.... He's super expressive. I can't believe Otis is 29lbs now :) He was 11 when we got him. Now he's a big muscle brick house. Ava should be a doggie personal trainer. She gives him quite the workout. 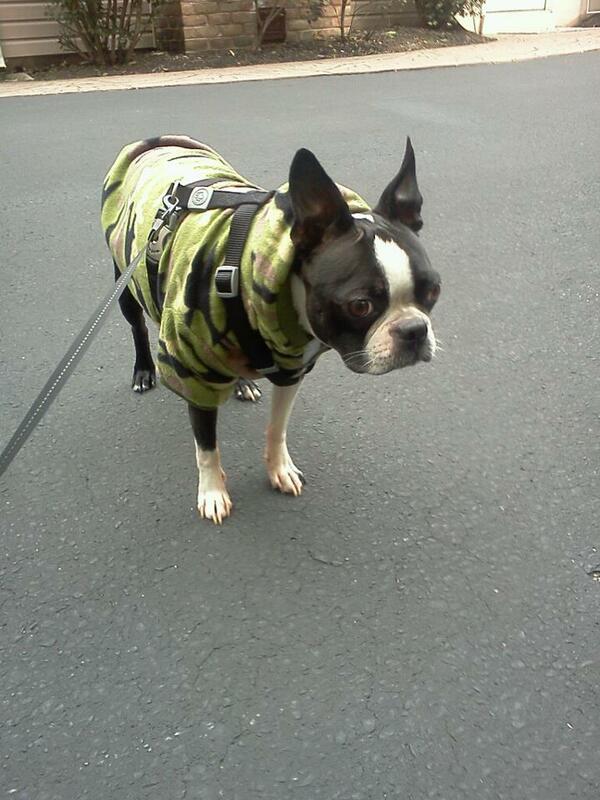 Ava is our 1 1/2 yr old apricot brindle Boston terrier. She was supposed to be 11 lbs, but is 19 lbs of muscle. She is super high energy and is just pure love. She and Otis (& Fernando the dog-kitten hybrid lol) are non stop all day. Gives the rest of the guys a break. Joy picked up wee little Koko (13lbs) today from the Bucks County Shelter where she was fully vetteod, including spay, enucleation and dental. She does have a bunch of eye drops for ulcers in her one good eye. Joy says she is "just precious". She stopped and bought her 5 new toys of her very own. I hope you got her another duckie. She seems to love this one in her pic. Joy - thank you so, so much. Joy says, "What a SWEETIE!! She has played NON STOP since we got home. We played tug for 30 minutes. Obviously, she missed the memo that she'll be 12 on 10/1!! Her little tail never stops moving-even smelling the others through the gates. Once again, Beadoe smelled of her and walked off. Go figure. I'm keeping her in the suite until she figures out this one-eyed thing. I suspect she's going to be just fine with my crew. Here's a picture I took when she FINALLY stopped moving!! It's blurry, but you get the idea." 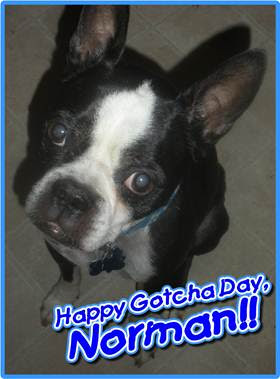 Today is our Normie Boy’s 2nd Gotcha Day. Two years ago today Sayre met me at McDonald’s in Lancaster County with my very first Boston foster. After being in foster care for several months, he was adopted to a family who returned him 4 days later. We anxiously drove to Harrisburg to get him back. Typically very nervous in the car, Norman curled up on my lap that ride home. I knew at that moment he wasn’t going anywhere. I could write a novel of all the hysterical stories we have had with this boy. He’s 11 ½ now, has poor vision and occasional incontinence issues, but is still very active, crazy as ever about his bouncy balls, and snuggles up with me in bed every night.